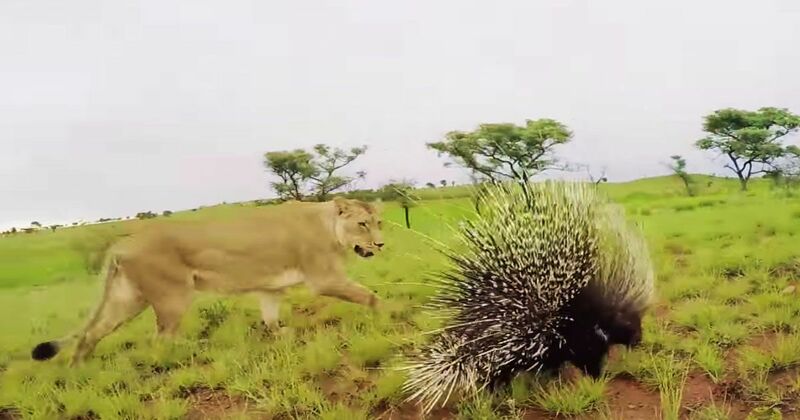 In a lion vs. porcupine situation, you may be surprised by the outcome. After all, lions are incredibly strong and fast, and likewise, porcupines are slow and small. However, in this clip posted by the The Lion Whisperer we see firsthand that size doesn't matter if you have a secret weapon! The video begins with the preface that a lion has met up with a porcupine and "she will lose". As the footage continues, we see a lion stalking a porcupine. Moments later, the porcupine does what they all do when they are threatened--shoots quills directly at the huge lion. While none of the wounds look too serious, it was enough to her to back off. It is further explained that porcupines can actually cause a lot of damage and even death to a lion. For example, if a quill gets stuck in the mouth, neck, or paw it will make it difficult for a lion to hunt and could ultimately lead to its demise. Lions are naturally afraid of animals that "blow themselves up" so one recommendation is to take along an umbrella in case you are ever surrounded in the wild. The appearance of "blowing up" will cause the animals to back off. This isn't the only time that a porcupine has a showed a lion who is boss. According to National Geographic, there is footage of a porcupine fending off 17 lions in South Africa's Londolozi Game Reserve. Despite being outnumbered, the little animal was able to effectively protect itself until the lions decided that it wasn't worth the trouble. While porcupines are noted as have a pretty even temperament, they will resort to protecting themselves if need be. As a result, they have very few predators because of their spiky quills. Watch the video to see this lion totally back down! Share with your friends.